When you are unhappy about your complexion due to clogged pores and excess oil, give your skin a treatment that will leave it calmer, cleaner, refreshed and purified. 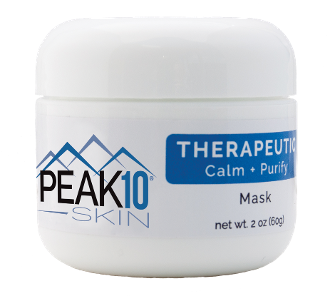 PEAK 10 SKIN® THERAPEUTIC Calm + Purify Mask provides a deep cleansing using a Bentonite clay-based formula that draws out impurities from deep within the skin, that your daily cleanser may not be reaching. It purifies, repairs damage, and restore the natural barrier to lock in moisture. This therapeutic mask combines safe, potent and scientifically proven active ingredients to purify problem skin. Once applied, it goes to work to draw out impurities and excess oil that block pores and cause blemishes and irritation. Sulfur and Salicylic acid work to help treat blemishes, decreasing redness and swelling. Sulfur works with the clay to remove excess oil and prevent future blockage. Zinc Oxide prevents excess oil from forming on the surface of the skin and helps reduce the appearance of blemishes. It also has a reparative properties to help with skin cell renewal, which is important for healthy skin. Our THERAPEUTIC Calm + Purify Mask was specially formulated with actives to target the most troublesome blemishes and oily areas. While purifying problem areas and preventing future problems, it provides a feel-good, relaxing experience. Smooth over clean skin. Avoid eye area. Leave on for 15-20 minutes in a relaxed position to let dry. Remove with a damp cloth. Aqua (Water), Glyceryl Stearate, PPG-3 Benzyl Ether Myristate, Zinc Oxide, Emulsifying Wax NF, Cetyl Alcohol, Titanium Dioxide, Glycerin, Camphor, Ceteareth-20, Colloidal Sulfur, Salicylic Acid, Bentonite, Melaleuca Alternifolia (Tea Tree) Leaf Oil, Tocopheryl Acetate, Retinyl Palmitate, Tocopherol, Phenoxyethanol, Ethylhexylglycerin, Yellow 5, Blue 1.